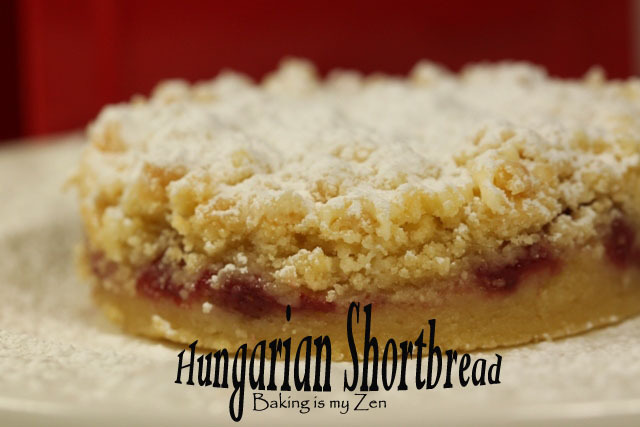 Seventh post with the group, Tuesdays with Dorie: Baking with Julia, and this week’s recipe is Hungarian Shortbread (pages 327-328). 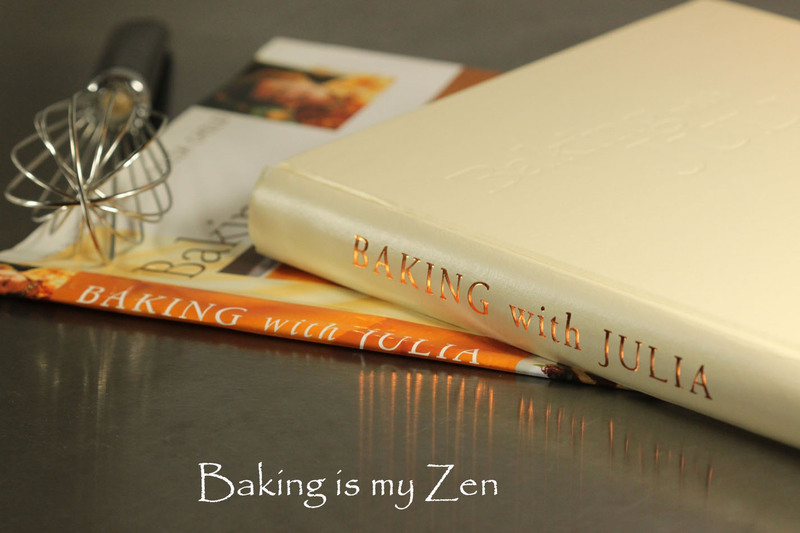 This recipe is from the book, Baking with Julia, by Dorie Greenspan. 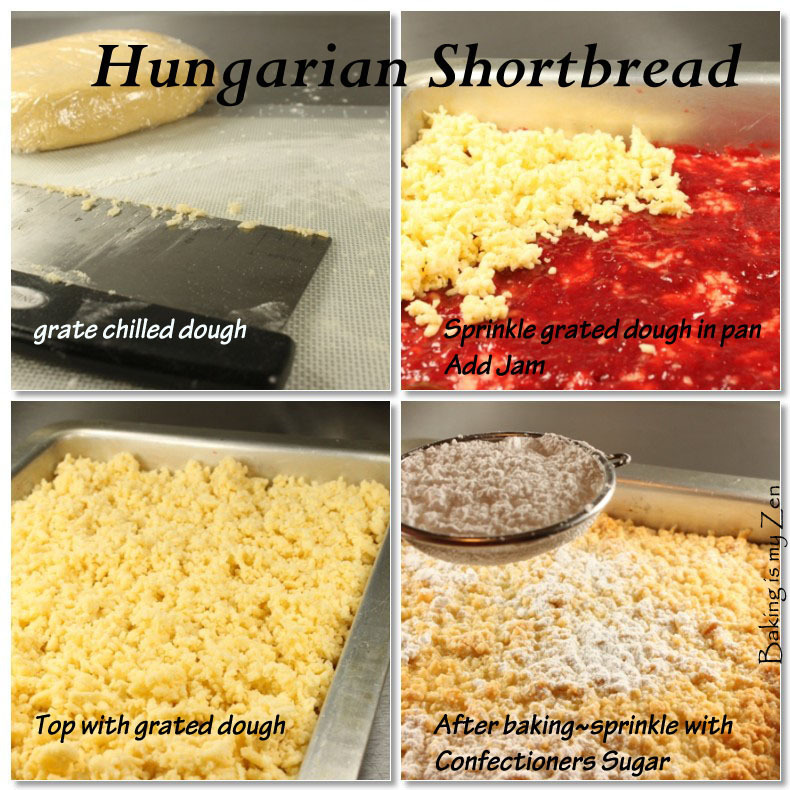 The contributing baker for this recipe is Gale Gand. Stop by the other bloggers posts to see their creations too. This recipe was easy to put together. It called for a Rhubarb Jam filling. Never had Rhubarb…wasn’t ready to experiment this go round. So, I decided to make my own Strawberry Jam. Good move. It came out spectacular. However, I will try the Rhubarb Jam one of these days. Will post the Strawberry Jam recipe in another post. The bottom half of the dough seemed uncooked. I didn’t want to overbake it. Next time, I will bake the first layer for a few minutes before adding the fruit and top layer. Also, instead of sprinkling the confectioners sugar on hot shortbread, I’ll wait a few minutes before adding. It is a keeper for my recipe files…(with a few tweaks). As promised, I’ll be adding a baking tip on my TWD:BWJ posts. Did you ever buy vanilla beans, only to find that they were dried out? Fret no more…use VANILLA BEAN PASTE instead. I LOVE this product. I buy mine at Williams-Sonoma. Cost is $11 for 4 ounces. Worth every penny! NOTE: Please DO NOT use my photography WITHOUT PERMISSION. This entry was posted in Baked, Dessert, Flickr-Food Bloggers-Dessert Love, Flickr-Macro Desserts, Tuesdays with Dorie: Baking with Julia and tagged Baking is my Zen, baking tip, Baking with Julia, Canon Rebel T1i, Carmen Ortiz, dessert, Dorie Greenspan, Hungarian Shortbread, Hungarian Shortbread with Homemade Strawberry Jam, Strawberry Jam, Tuesdays with Dorie: Baking with Julia. Bookmark the permalink. Hi Jane! Yes, this was delish. A keeper. As usual, your pictures are great! The round shape make them prettier. It looks wonderful! I’m not a rhubarb fan – never cooked with it, as a matter of fact, though I do prefer tart over sweet most times. The vanilla bean paste is worth a trip, I think. I use the Madagascar Vanilla from the same manufacterer and love it. Diane. The idea of making half a batch is great. Looks great! Again, your photography is amazing! I love your photos, I think I say that every time, but there ya go! I also love strawberries and I think this sounds soooo delicious! I am going to have to try that next time. Hi Amanda, thanks for your kind comment. I don’t think I’ll ever buy Strawberry Jam from the jar. I will try to make the Rhubarb Jam. I’m curious. 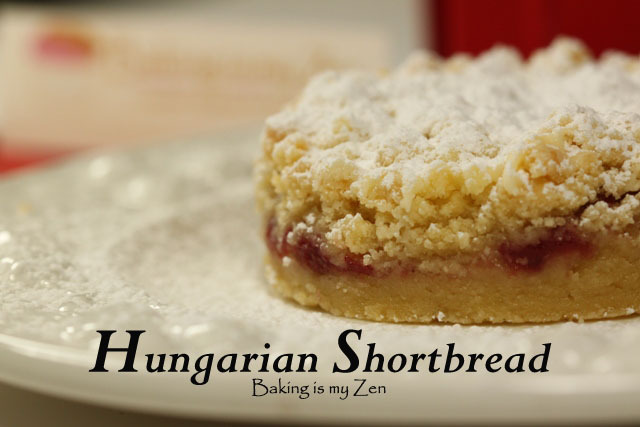 Your shortbread looks fantastic. Great photos! I love vanilla bean paste! It’s great! 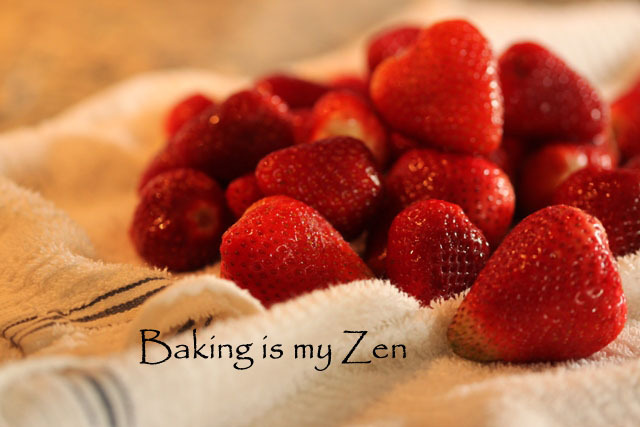 Your photos are beautiful and I’ve always wanted to make strawberry jam! Thanks sanyaliving. The Strawberry Jam was so good! I’ll bet this was delicious with fresh strawberry jam! It looks just perect. I think it would be a good idea to prebake the bottom layer first, as well. Susan of (www.createamazingmeals.com), it was very good. I was pleased! Next time I will bake the bottom layer for a few minutes before adding the additional layers. Beautiful, Carmen! I have not tried vanilla bean past yet, but will pick up a bottle the next time I see it. Thanks! Elaine, you’ll like using the vanilla bean paste. Do try the rhubarb jam with this some time – the tartness of the rhubarb is really wonderful against the sweetness of the shortbread. 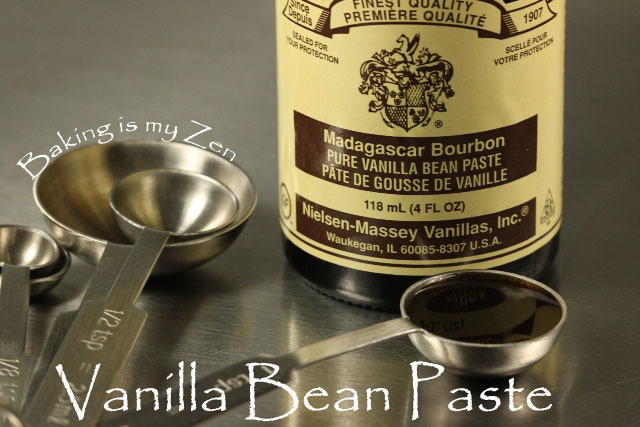 I’ve been coveting vanilla bean paste for a while now and must justify its purchase some time soon! Thank you for the compliment. YOUR BLOG is wonderful!! When commenting, please provide your blog link so I can respond back quicker AND others can see your blog…it’s a MUST SEE. 🙂 I’ve added it below.